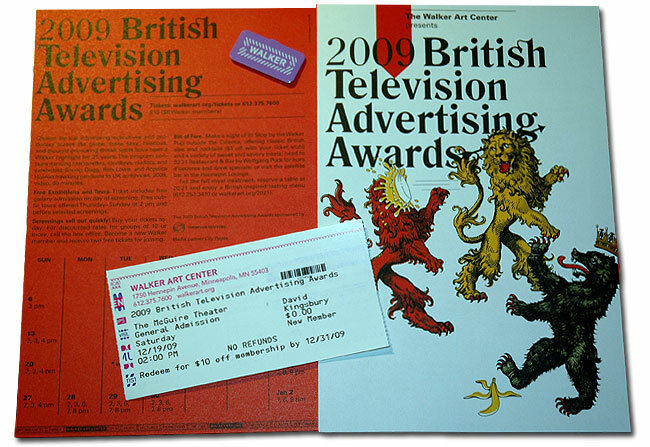 Yesterday Colleen and I made our annual trek over to the Walker Art Center to see the British Television Advertising Awards in the beautiful McGuire Theater. Before the show, we spent some time going through the galleries, including the new Benches & Binoculars exhibit. The layout reminded me of museums we saw in the UK and was well done. Be sure to pick up the handouts if you go – they have a lot of great info in them. After the galleries, we had lunch at Wolfgang Puck’s 20.21, which was surprisingly crowded for that time of day. Colleen tried the tasting menu and selected pot stickers, salmon and chocolate cake (with a 20â€¢21 bellini to drink). I had the Singapore style street noodles with masala braised short ribs and the cookie sampler for dessert. Pastry chef Corinne Sherbert helped us select the desserts and brought them to our table. They were all good, but I really liked the cheesecake brownies. The show lasts about 80 minutes and tickets are $10 for the general public ($8 for Walker members). The last screenings are on Saturday, January 2, but many of the remaining dates are already sold out. This started about a week after I turned on the sprinkler system. Master Sprinkler Systems said I should call their plumber (Duda Plumbing in Hopkins, 952-933-5636) with the part number. It’s a Watts Regulator, model 800M4-FR, as far as I can tell. Anybody out there know what would cause this to happen? Do I really need a plumber?